Discussions Magazine Music Blog: Coming soon: RIGHT SAID FRED exclusive interview and music video! Coming soon: RIGHT SAID FRED exclusive interview and music video! So much happening in the world of music and entertainment! For those of you who grumble about the lack of good music nowadays, you are definitely NOT paying attention! I recommend you to stop by this blog as often as you can. We'll keep you updated! 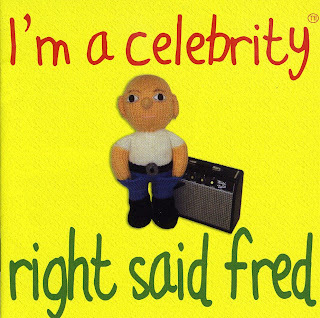 Anyway, really excited about some upcoming things I wanted to share with you, and they both have to do with RIGHT SAID FRED! First off, the video for their latest single, "I'm A Celebrity", should be completed and appearing HERE any moment now. We'll bring it to you first! Secondly, Richard and Fred Faribrass (the two gents who make up RSF) have kindly sat down and answered a bunch of questions from yours truly. This is going to make for an extremely interesting interview and will blow your socks off! Great stuff, indeed! So, keep checking back. I'll be here!